Quartz Battery Operated Clock Motor for 1/4" clock face. You will need the use of a 5/16" drill bit. Next, carefully measure the glass to find the center of each piece and make a mark. Drill a hole through each piece directly through the center of your mark. Peel the protective covering off of the glass pieces. Clean the glass with window cleaner and paper towels. On one piece of glass, try arranging the flowers around the edges without using glue to come up with a design that you like. Also, place the doily down, centered over the hole, to check your flower placement. After you have decided on a good place for the flowers you are ready to glue them on. Working on one corner at a time, start with the flower or leaf that is going to be under the others. Use a toothpick to apply a very tiny amount of glue to the back of the flower or leaf. Return it to its position and press lightly. Continue to glue the flowers and leaves working from the flower or leaf that will be below the others, and gluing one at a time, overlapping them slightly, with the ones that are on the top layer. Carefully place the doily centered over the hole. Press into place very lightly. Clean the top piece of glass and then lay the two pieces together. Next, put the washer back on the shaft, then the hex nut. Making sure that the motor is still in the right position. Tighten the nut into place. Now you need to put the numbers onto the clock face. 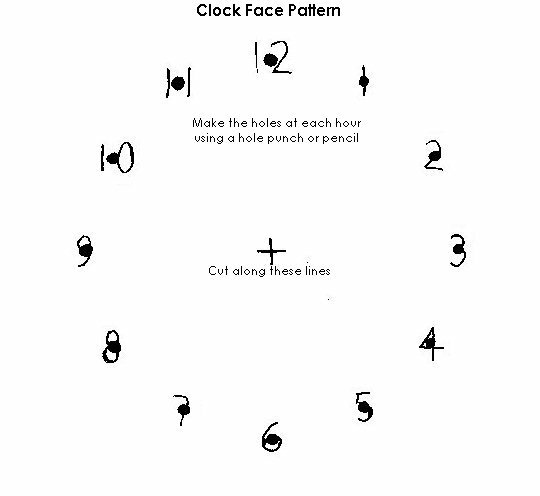 Using our helpful clock face pattern, Place the pattern over the center shaft. Using a ruler, make sure that the pattern hole for the 12 o'clock marking is horizontally centered on the clock. Hold or secure the pattern in place and make tiny markings at each hour with a washable marker. Place the hour dial onto the shaft and press lightly into place, pointing at 12 o'clock. Put the minute hand onto the shaft, point it at 12 o'clock and lightly screw the minute nut into place. Press the second hand onto the tip of the shaft. Starting at the bottom of the clock edge, Apply a small amount of the clear non-water based glue to the bottom edge. To attach the ribbon to the bottom edge, start at one end, put the end of the ribbon on the glue and hold in place with your finger. Using your other hand, pull the ribbon so that it is taut and carefully lay it onto the glue along the whole length of the bottom edge. Lightly press along the ribbon. Again, add glue to the next side edge of the clock, pull the ribbon again so that it is taut and carefully lay it onto the glue along the whole side edge of the clock. Continue all the way around the clock. When you reach the bottom edge again, allow a 1" piece of ribbon to turn the corner and overlap the starting place of your ribbon. Trim, and glue in place. 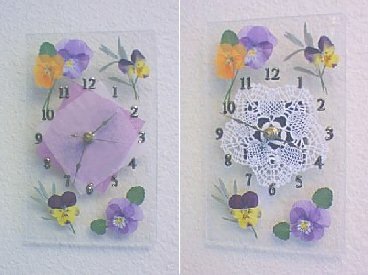 Your clock is complete. Makes a great gift for Mothers Day or Anytime!